Toast your favorite type of noodle with this grown-up macaroni necklace. Most of us stopped making jewelry out of pasta back in the first grade, no? Not so for Michale Dancer: no food, it seems, is off-limits in the business of bijoux. 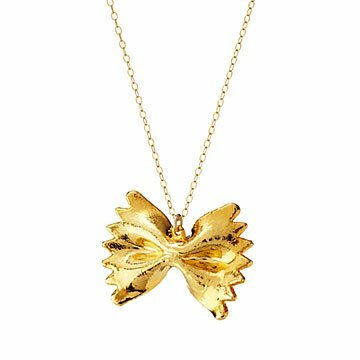 Like many crafty youngsters, seasoned jeweler Michale begins each necklace with a real piece of bow tie pasta (code name: farfalle), which she plates in 24-karat gold and strings on an elegant gold-filled chain. A perfect pick for your favorite foodie. Handmade in California.